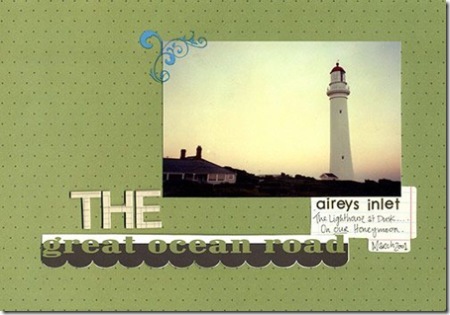 one of the most common threads through all of those who are using the Been There Done That range is that these papers are enabling them to scrap old photos that have been at the bottom of the pile forever, awaiting the perfect papers. another delighted discovery was that these papers not only co-ordinate with the other papers in its state range, but they also go beautifully with papers in other states as well. 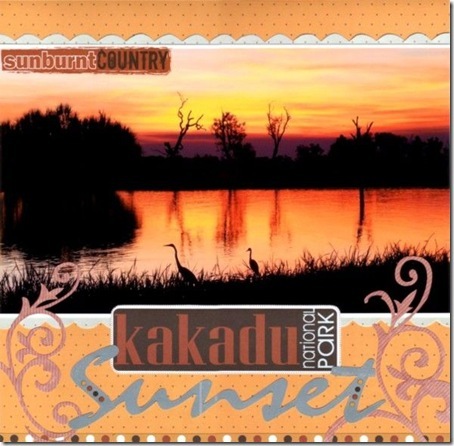 very australian! 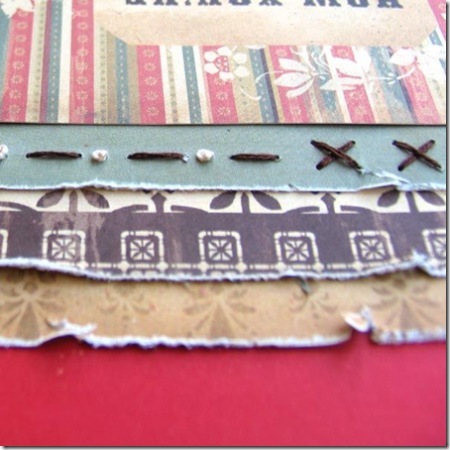 Chris has mixed and matched 3 different ranges of the BTDT papers for this layout. 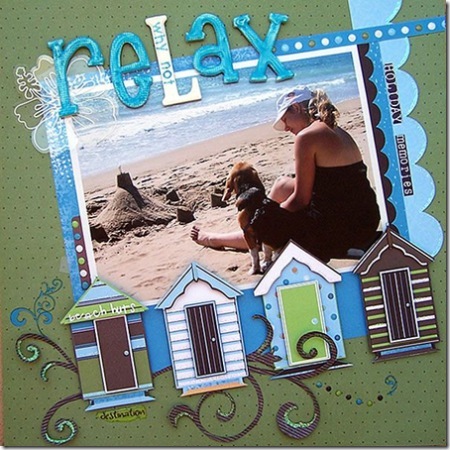 She thought the beach houses from the Vic range would make a great accent for this beach photo of herself and Annaliese. 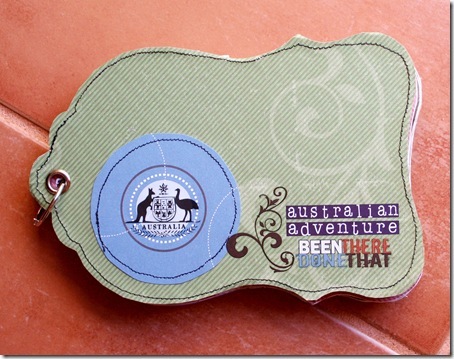 She also combined the Bluebells from the ACT range with some QLD rub-ons and title. 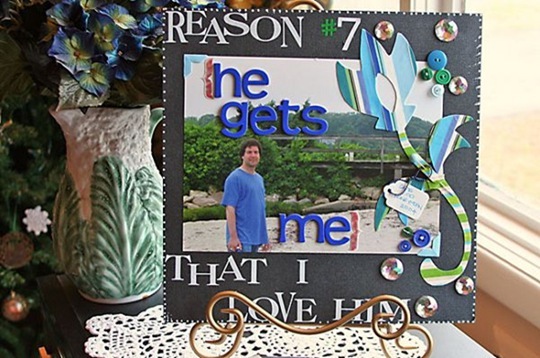 Because the picture is so stunning, Chris wanted to very simply embellish this page with the title, some handcut swirls and a couple of rub-ons. 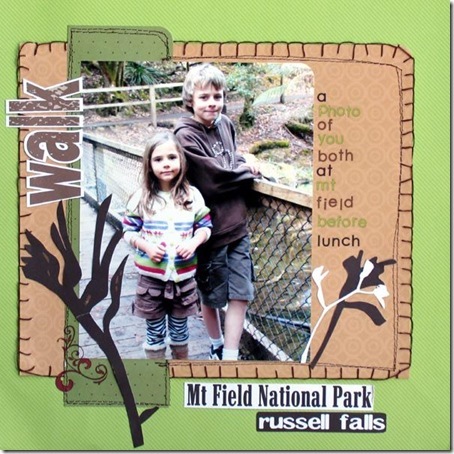 Mel has combined a variety of patterned paper from several states to create this layout of a snapshot taken at Mt Field National Park. 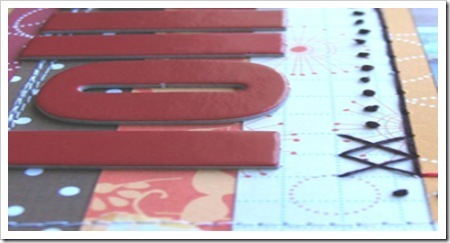 For a fast and effective title she has simply cut out the appropriate names from the Tas Titles patterned paper and adhered them on her layout. A little chocolate brown blanket stitch has finished everything off nicely. 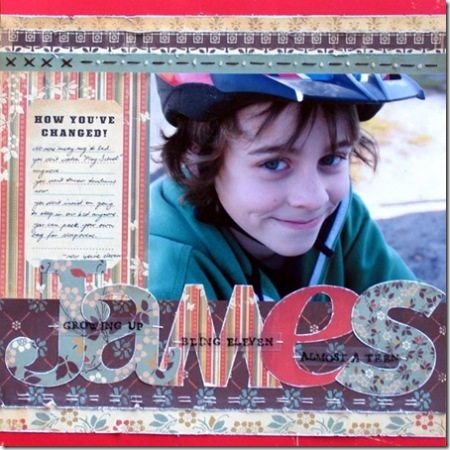 When Jaimie's family took an extended vacation to the East coast earlier in the year, she ended up with hundreds of photos to scrap but not the right paper. 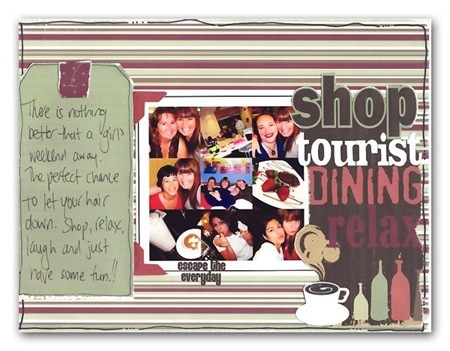 When the BTDT ranges came out Jaimie couldnt wait to get her hands on them to create this mini album of their trip. 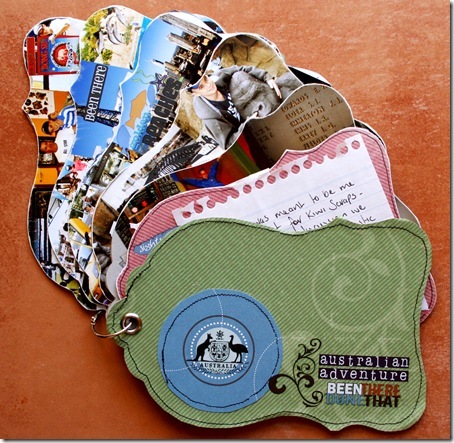 Jaimie said "All the work is taken out with these papers - they have everything you need to create treasured keepsakes of your travels. 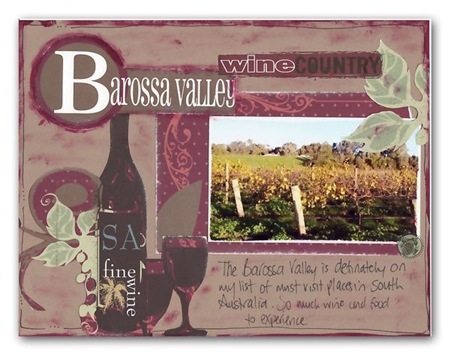 The best thing is that you can easily mix and match because they all tie in together - Perfect"
Belinda has created this beautiful country wall hanging using the more natural colour palette from several states, handcutting the vine leaves from the SA state, and mixing and matching the rubons to suit. Pinks and plums and sage green, the colours of vineyards and rich soil and the state floral emblem, the Sturt Desert Pea. 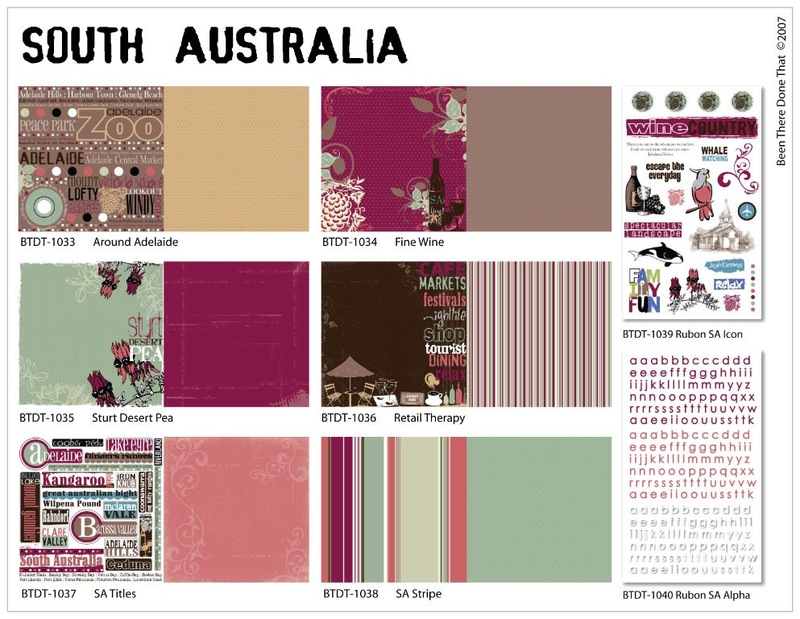 South Australia is a little feminine, a little earthy and can even be a little Christmas. Stunning talent on today's post we have to thank Janine King, Dianna Sullivan, Kathie Link, Carole Janson, and Lee Woodside. Cheryl mixed and matched the stripes and patterns of the South Australia range to create this cool layout about her boys rugby obsession. 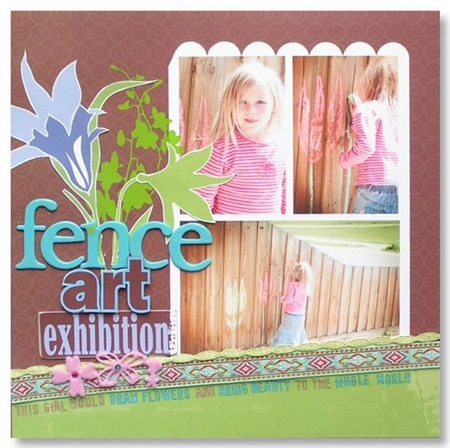 The very linear look is softened by the wildflowers and flourishes of the paper, and the curve of the cherryArte chipboard title leads the eye into the photos. And the 'footy fever' rubon from the Vic range was just too perfect not to use. 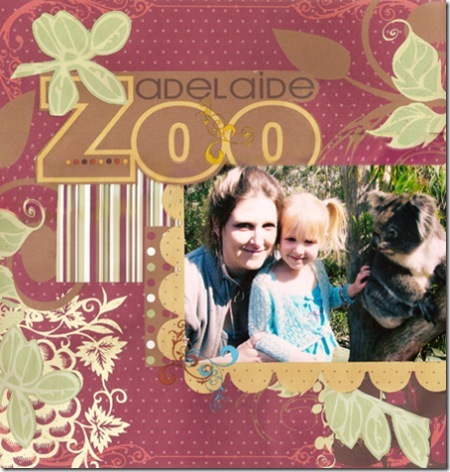 The Adelaide Zoo was the theme of this layout, and Steph used the gorgeous range of Adelaide Inspired Patterned Papers to showcase her photograph. Steph mainly hand cut the leaves and background of the piece and cut a scalloped edge from the 2nd side of one of the papers to add interest to the photograph. 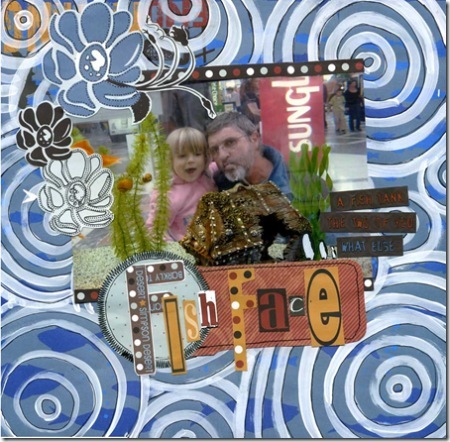 Lee Woodside: I love to cut up patterned papers especially those that contain great design features. 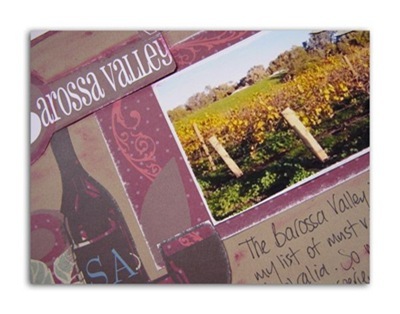 This layout features elements from the "Fine Wine" paper as well as the title from "SA Titles". 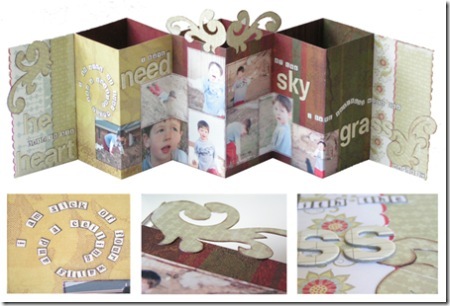 The papers are backed onto Kraft cardstock a great foundation for these papers. 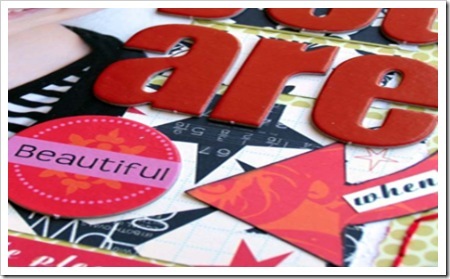 I mixed together red and black paint to give a similar colour that features in these papers. 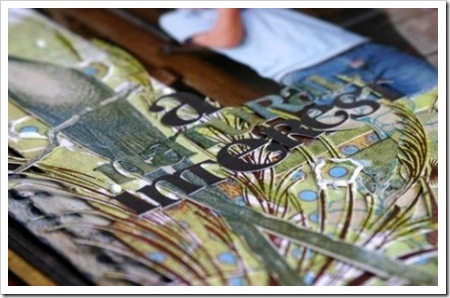 I dry brushed around the edges of the layout, the title and throughout the layout as well. 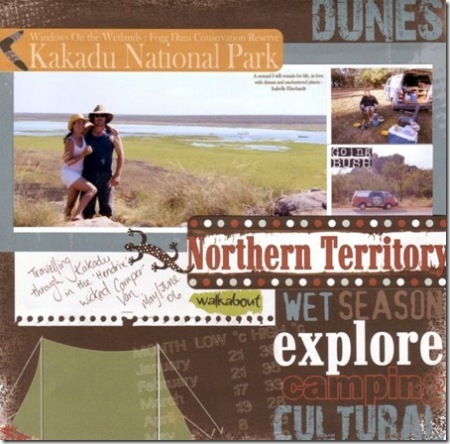 Lee Woodside: This layout features papers from "Retail Therapy" and "Sturt Desert Pea". The words and pictures were just what I needed to feature a fun weekend away. I cut down the titles a bit and only featured some of the words. 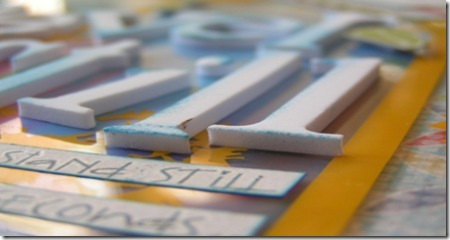 The edges of the layout have been sanded as well as the edges of the title piece. 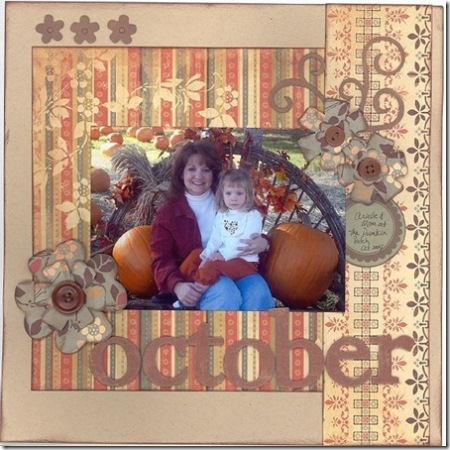 Carole Janson: I used the SA Products for this layout (papers and rubons), and just had fun cutting out different parts of the papers and added and layering them to the layout, I also scalloped strips of pattern paper. 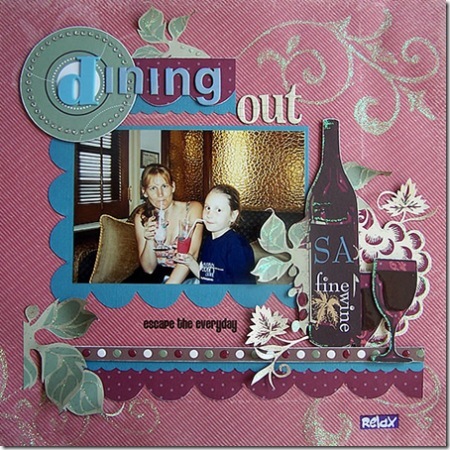 I also used dimensional magic for highlights the wine in the glass, and kindy-glitzed the flourishes to bring out the flourishes in the background patterned paper. 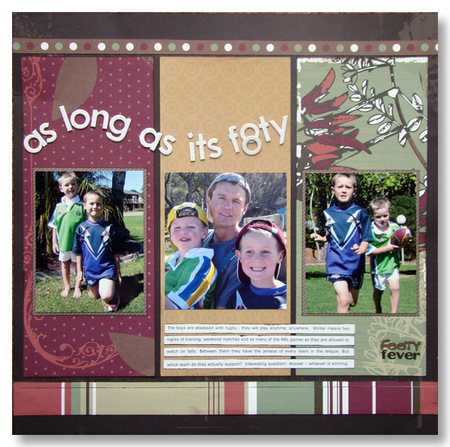 Dianna Sullivan: I enjoyed creating this layout using the South Australia range, even though the colours were not what I usually use. 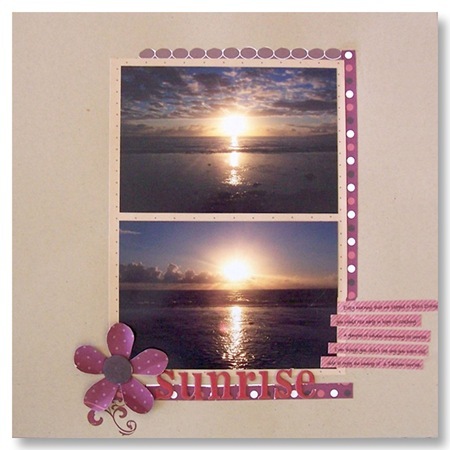 I loved that I could use the words that were on one of the pages as strips on my layout and they fitted completely in line with my recent holiday to Tahiti. 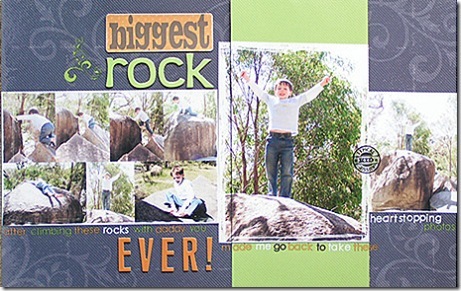 The Tourist title was fun to make. 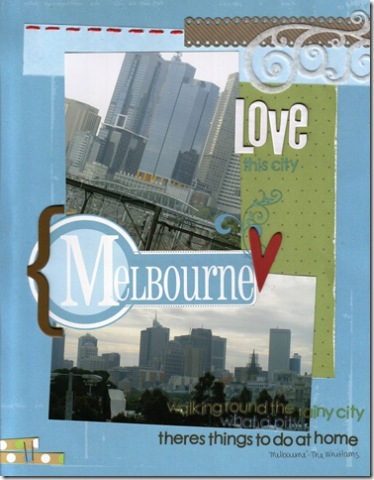 I used one of the larger South Australia titles and covered the circular part with a journaling stamp and which went nicely with the overall theme I wanted to create. 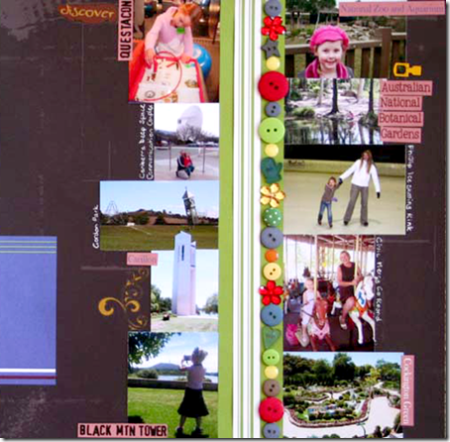 Dianna Sullivan: Enjoyed doing this layout as the SA papers went beautifully with my photos and cardstock. 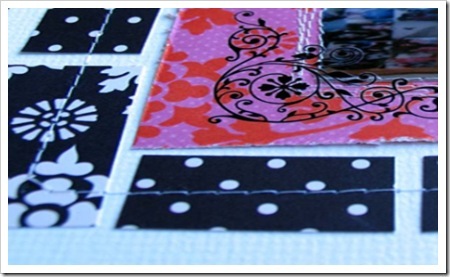 I used some of the SA title papers and cut and placed behind the main patterned paper on my page. Used Heidi Swapp chipboard Alphas for the title and traced a cherryArte chipboard flower with the patterned paper and finished by using the flourish from the South Australia Been There Done That rubons as a stem for my flower. 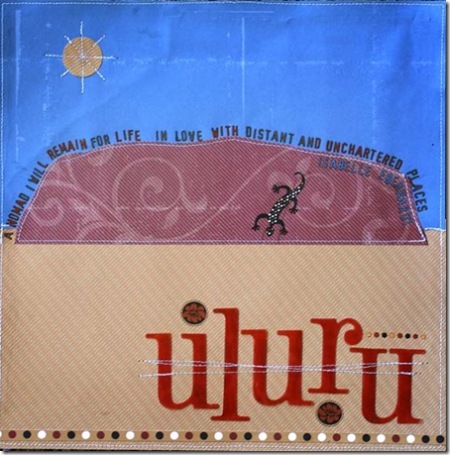 Diana Sullivan: The title "nightlife" seemed to go so well with the story behind this photo. On a recent holiday to Tahiti my daughter Arwen got locked in the toilet on our very first night there and it took us more than two hours to get her out. She was so upset and it was NZtime about midnight, this photo was her sleeping after all that drama. I used the paper with the grape vine on because it reminded me of the gorgeous duvet covers that they had in Tahiti with the leaf designs on and I used some BasicGrey patterned paper to cut the leaf fronds around the layout. Kathie Link: Since having Jamie I don't have the time to go jogging and I really miss it. Creating this layout is about as close as I'll get for the moment, although it didn't burn half as many calories! 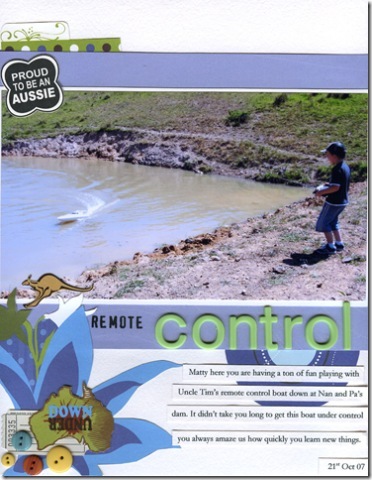 Janine King: With school holidays approaching rapidly, I have got some fun activities for you to complete with your children. Other than your regular scrapping supplies, you may need to stop off at a craft shop to get a few extra goodies- goggle eyes, mini pom poms, glitter pipe cleaners and bells. A quick stop at the supermarket for candy canes and lollipops may also be needed. 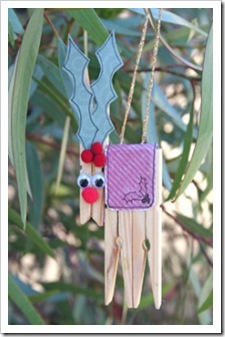 The peg reindeer is very cute and easy to put together. 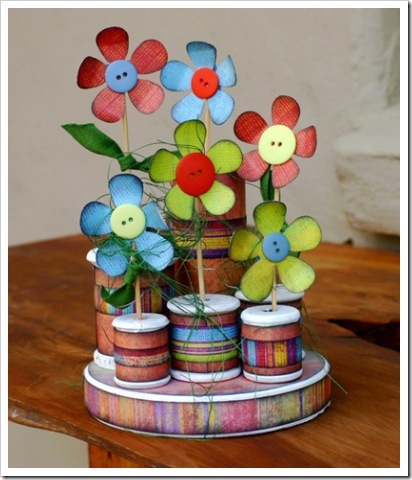 Simply pull three wooden pegs apart, re-glue and decorate as shown. 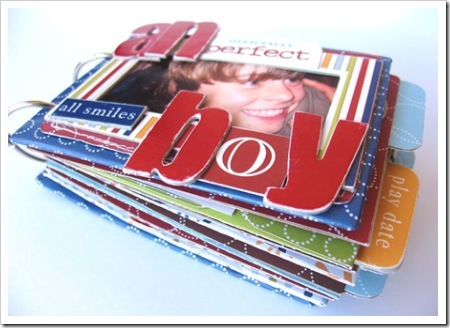 Great gifts for the kids to make for the grandparents! 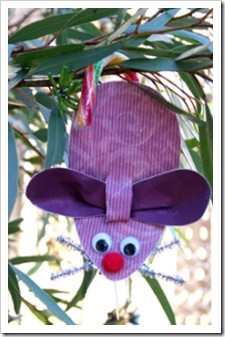 The candy cane mouse is a hit with my kids- again easy to make and great for little gifts for friends. 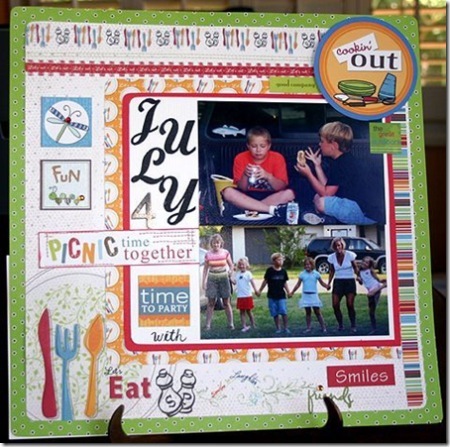 Simply cut out (using the template) and assemble as shown. The candy cane becomes the mouse’s tail. A little more work is involved with the bead footed reindeer. 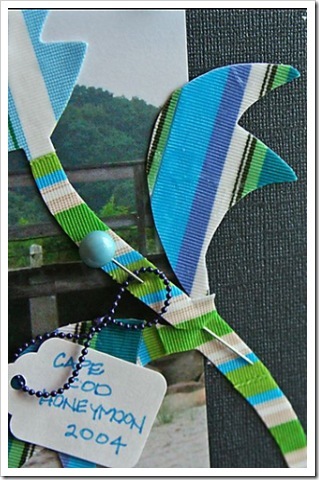 Cut out using the paper template and assemble. 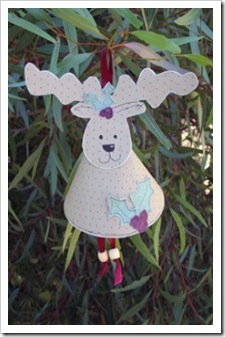 I have used ribbon from my stash as the reindeer’s legs however you could use raffia, string or wool. 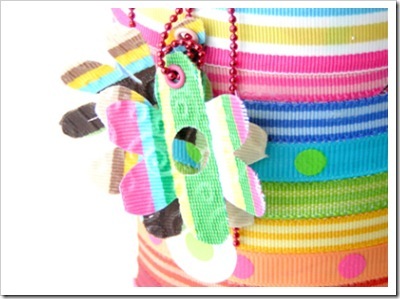 The beads could be replaced with bells if you wish. The holly I have used to decorate the reindeer with is simply torn from scrap paper. 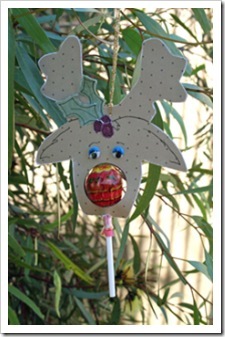 The lollipop reindeer is a favourite with my girls. 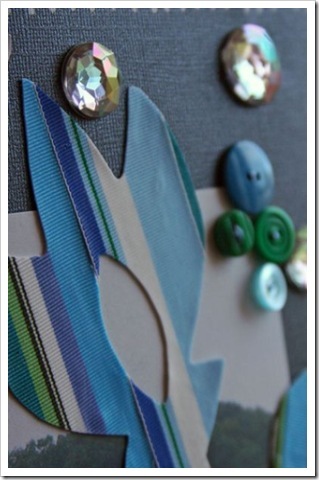 Use the template and cut out the paper. 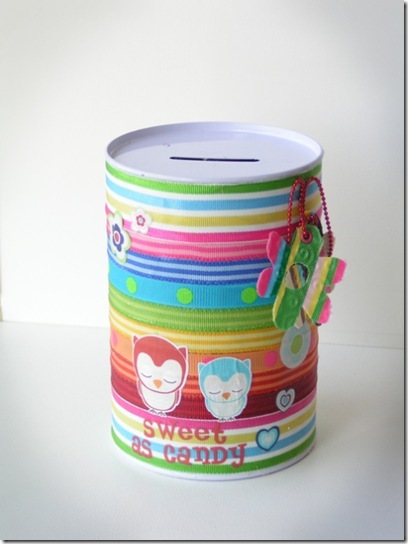 Use a punch or circle cutter to add the circle, add the lollipop and decorate. 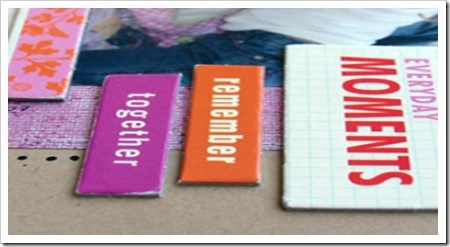 These would be great for an end-of-year school party. 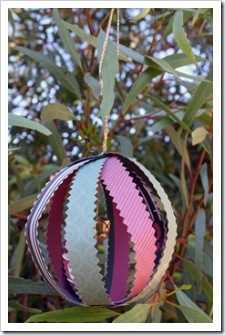 This paper bauble is made with left over paper. I used decorative scissors to add interest. I have cut five 12” strips and formed a bauble shape. If you look closely inside I have added bells while adding the hanging thread. Adults- your turn. J - Although kids could make these, I don’t recommend then drinking the wine- LOL!!! 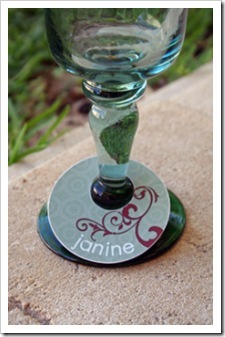 I made the wine glass name card using my circle cutter. I have cut one circle and then the other off centre. There is a slit at the back to allow the circle to be placed around the stem of the wine glass. I have decorated and added the required person’s name. This would be great to use as a table placement card as well as a wine glass identifier. I have covered this pre bought wooden Christmas tree with the gorgeous ‘Been There, Done That’ papers and decorated. 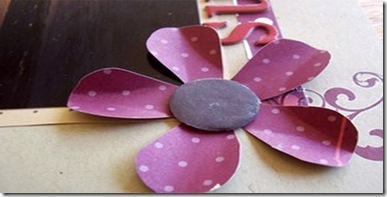 Really the kids could complete this project too, however they may need a little help covering the wooden pieces. 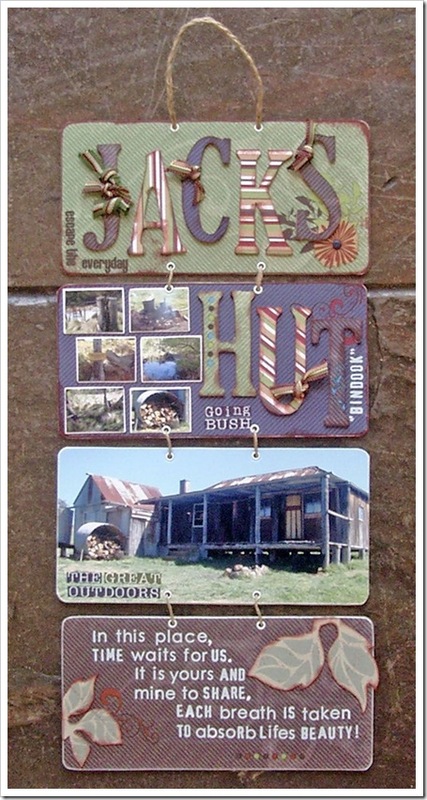 Chr­is created these stylish cards by combining the SA range of papers and rub-ons with Crate Paper sentiment rub-ons and a deluxe designs chipboard plaque. 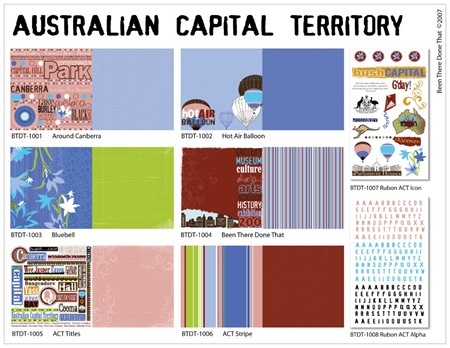 A soft mauve, deep blue, rich brown and musky pink are pepped up by a striking, almost lime green in this eye catching colour story celebrating the highlights of the nations capital. 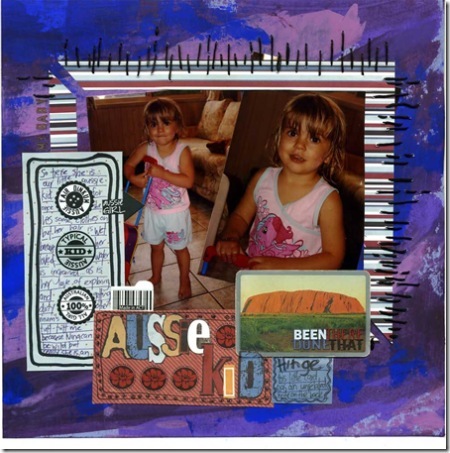 With this post we struck more gold in the way of Aussie scrapbooking talent and we thank talented guest designers Tracey Kidd, Steph Fraser, Joelene Pienaar and Yvette Adams for their fabulous creative work. 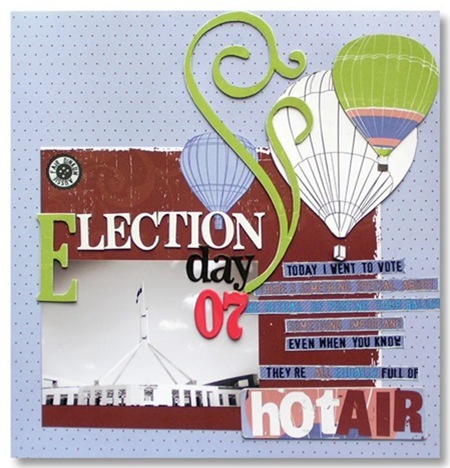 Although Cheryl has neither confirmed nor denied the existence of the double entendre in the 'hot air' words on the Canberra papers, working on this range on election day of all days, Suz couldn't resist playing with the pun. This was just one of those layouts that records a fleeting moment and feeling and because of the versatility of the papers, it came together almost as fleetingly. Although she keeps changing her mind, (Victoria's a close runner up) Suz claims that the ACT colour story has probably ended up her favourite. 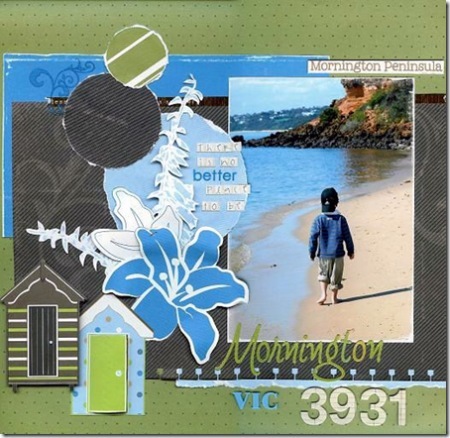 Here she has used the backs of the papers - the gorgeous rich brown and green along with a handcut bluebell work fabulously with the BasicGrey Gypsy ribbon and a smidge of Hambly. 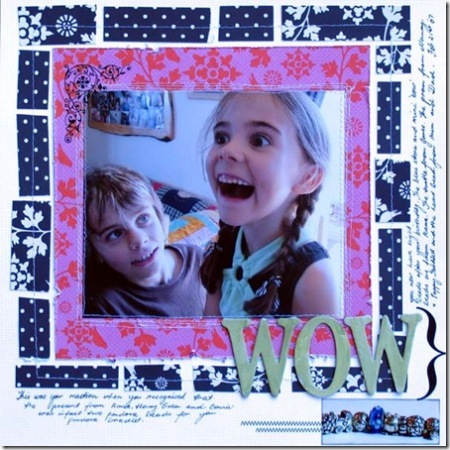 Again the bluebell shows off it's versatility in this layout created by Cheryl. 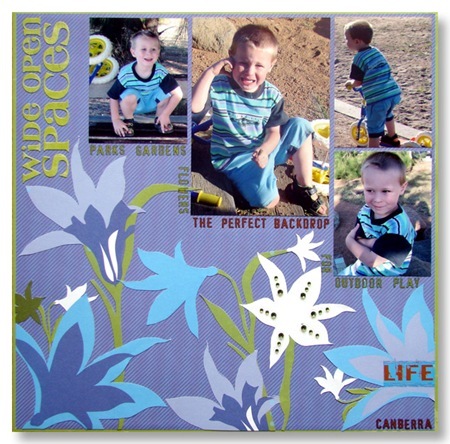 Although she was initially worried about using flowers on boy layouts, her boys are born and bred in Canberra and this bluebell is even on their birth certificates, so it's nice to have a record of it in their albums as well. 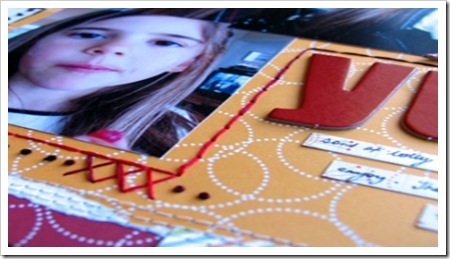 Cheryl has aligned her journalling with the steps created by the bottom of her photographs for added visual interest. Yvette Adams: Canberra has been my home for 13 years now. In the last few years, since our daughter came along, our little family has enjoyed exploring Canberra and playing tourists. All year I've been thinking about creating a layout about our town, and these papers got me all inspired to do just that! 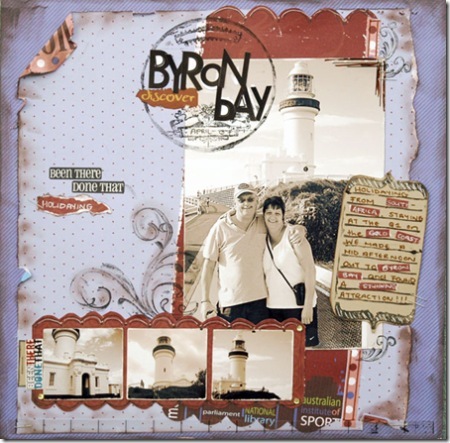 Jolene Pienaar: In keeping with the travel theme of the papers, I went with some photos of the Byron Bay Lighthouse, I added a bit of inking and distressing to add a bit of interest to these gorgeous papers. Jolene Pienaar: The floral paper of the ACT range jump out at me from the start, the gorgeous rich colours are just perfect for summer. It didn't take long for me to get cutting and playing. 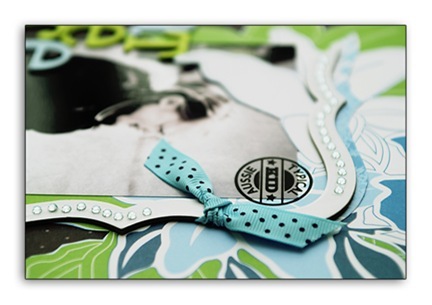 The paper matched up with some gorgeous Queen & Co beads perfectly. Steph Fraser: I haven't been to ACT before so I chose to use the other sides of the paper. This is a picture of my seven year old daughter. I used Heidi Swapp chipboard alphabet - Newsprint in Jet, Heidi Swapp Florals in white but I chalked them slightly so they weren't so white. 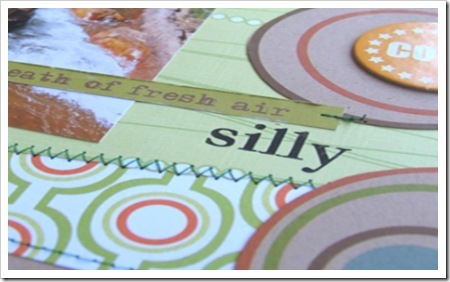 Basic grey Rub ons - Wholy Cow and a floral stamp that you may or may not notice in the background stamped with a versamark inkpad that gives a watermark effect. I love using this technique as it can change a plain piece of paper and add a new dimension to it. 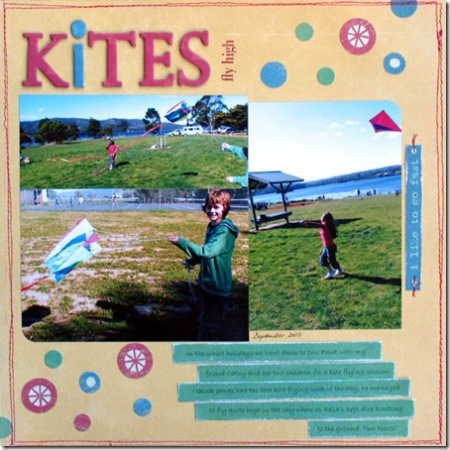 Tracey Kidd: Choosing a photo for this challenge was easy as these papers really do go well with outdoor theme pages and the rubons are super easy to use. 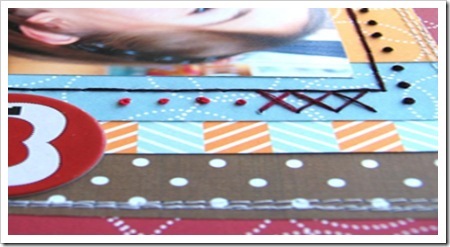 Lately I find myself rubbing the rub-ons onto cardstock then cutting them out so they add more dimension to my pages. 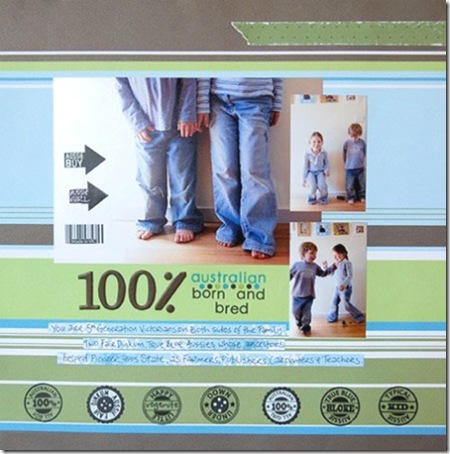 I just love the whole aussie feel about this layout. 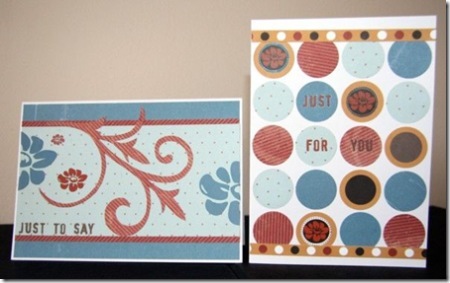 Again, Chris took the opportunity to create a few cards with the scraps from her layouts. 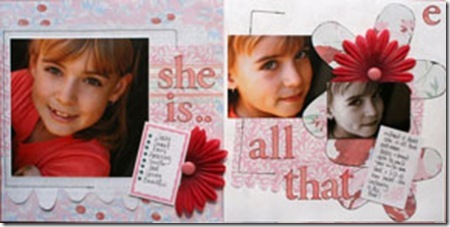 Using the rub-ons and simple designs Chris has put together a collection of cards ready to use when she needs them. 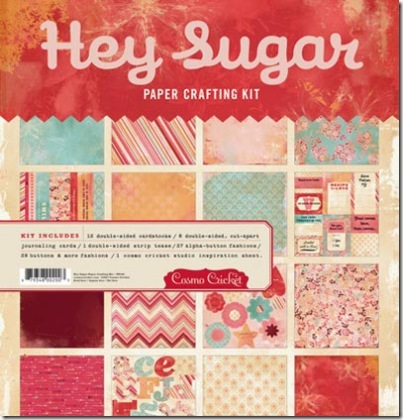 we have an abundance of riches to share with you today all featuring some of our favourite patterned paper ranges from Crate Paper. 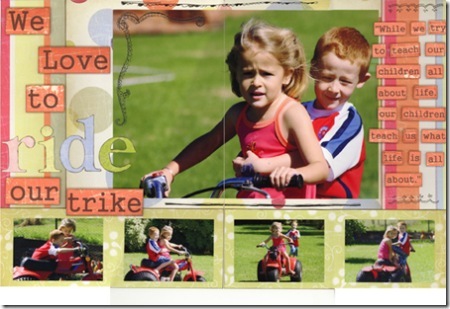 To begin, Mel Goodsell has outdone herself with these four fabulous layouts. 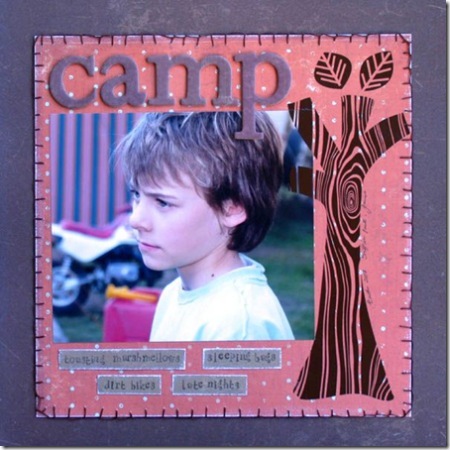 Mel has blanket stitched around a sheet of Coral patterned paper (Crush collection) and combined Orange County Crateboard alphas plus Hambly Screen Print rubons to create a layout about her son's favourite memories from their Easter camping trip this year. 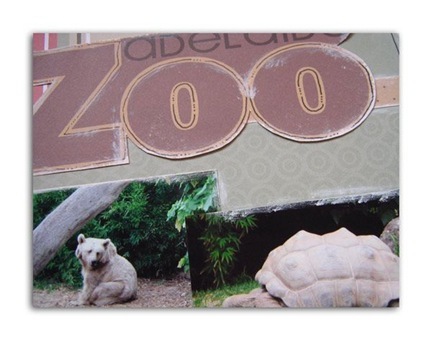 The Zoom range of patterned papers doesn't always have to be about planes, trains and automobiles! 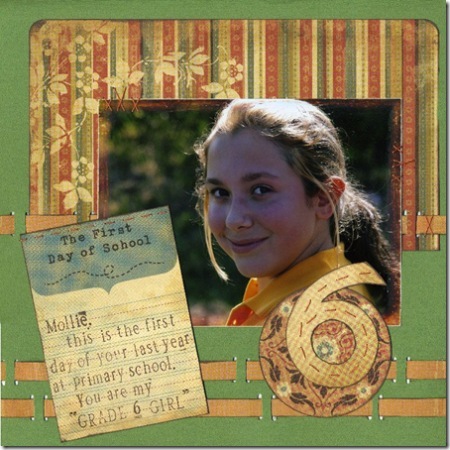 Mel has demonstrated that here with a fun layout using up some of those hard to scrap photos. 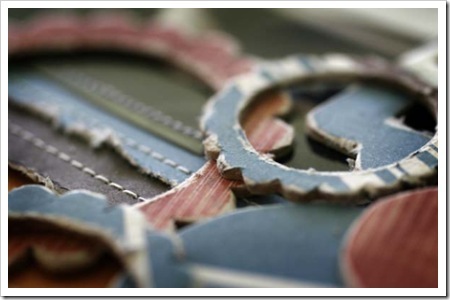 The circles have been hand cut from the Wheels patterned paper and the title is a mix of Zoom crushboard and rubons. Of course if you do just happen to have some plane, train or automobile photos around, the Zoom range is just perfect! 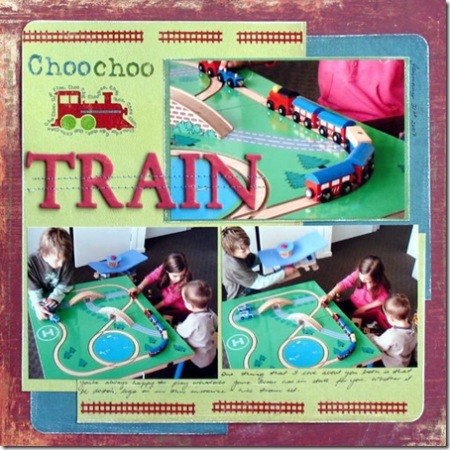 Mel has used the train track rubons to add a border to the top and bottom of her layout and the main title (Zoom crushboard) has been stitched into place to reinforce the train track theme. The yummy autumn tones found in the Crush collection of patterned papers sit perfectly with many of the Heidi Swapp orange, green and brown coloured decorative tapes available. 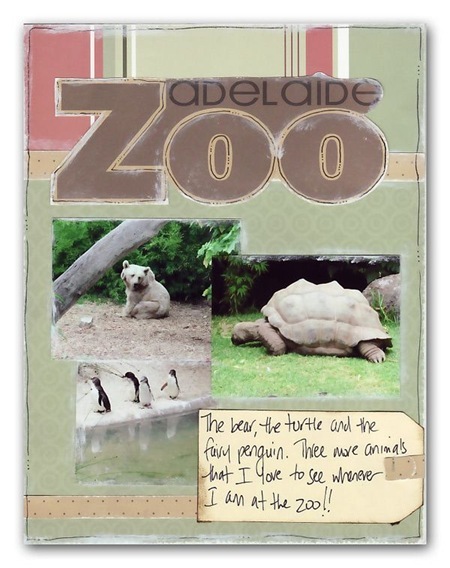 Mel has used a single strip of tape across the bottom half of her layout and completed the page using chocolate chipboard alphas found in the Orange County Crushboard pack. 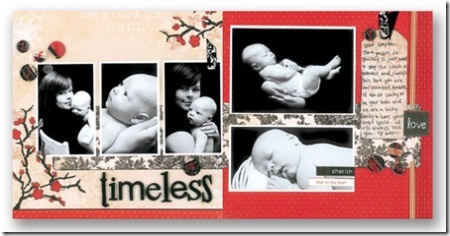 Why not use this range to make some gorgeous handmade gifts for a new born baby as Chris has done. 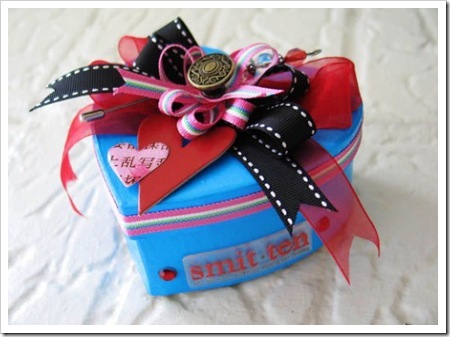 Plain gift bags can be found at craft shops and door hangers can easily be made by covering some chipboard that has been measure and cut to size. Chris loves how 'inkable' the crate paper range is also. 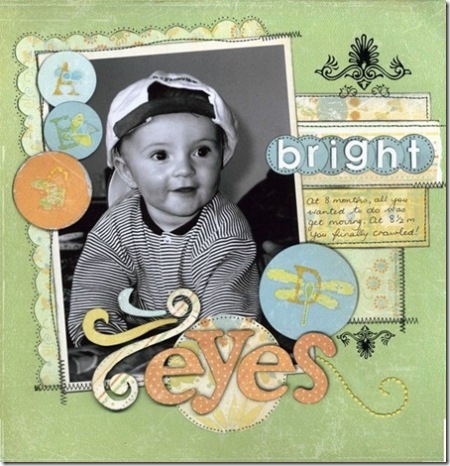 Keeping with the baby theme Chris has blocked her photos and journalling on this layout and kept the lines very simple yet effective. 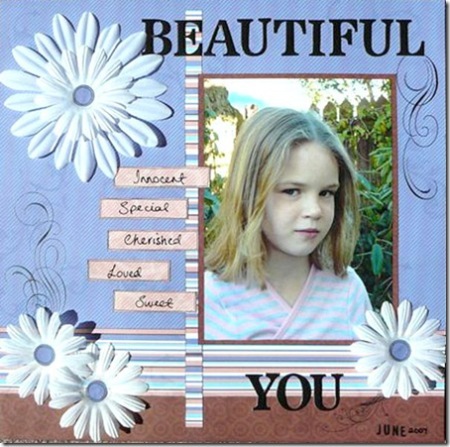 Chris added a very interesting stamped border around her photos using the Sassafras Lass border stamp. 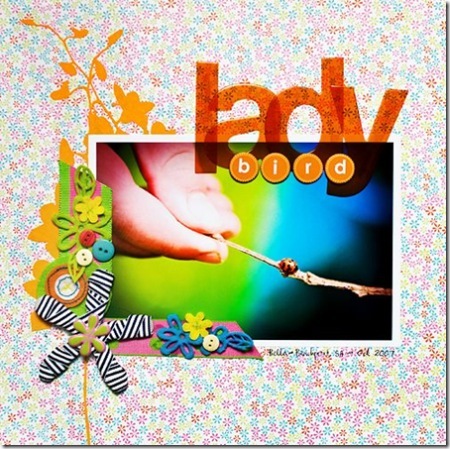 Chris stamped the images onto the Baby Bee paper, cut the images out and then secured them around the edge of her photos. 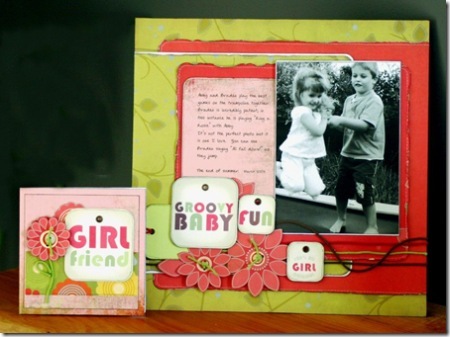 We discovered these gorgeous layouts both created by Donna Meuli and both using the Baby Bee range. 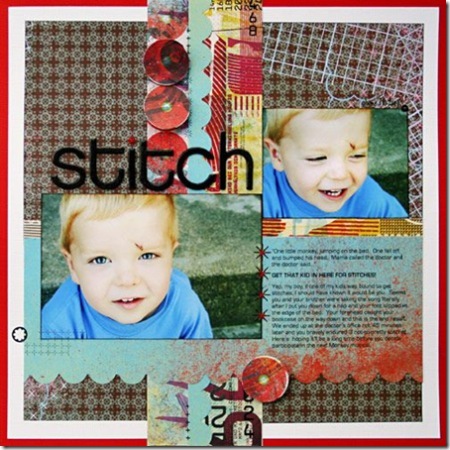 We love the way Donna has incorporated hand stitching and machine stitching to her layouts, it really compliments the Baby Bee range. 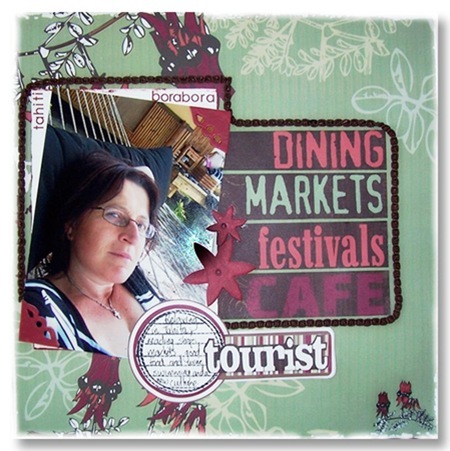 It's wonderful to have your creations on the blog this week, thank you Donna. 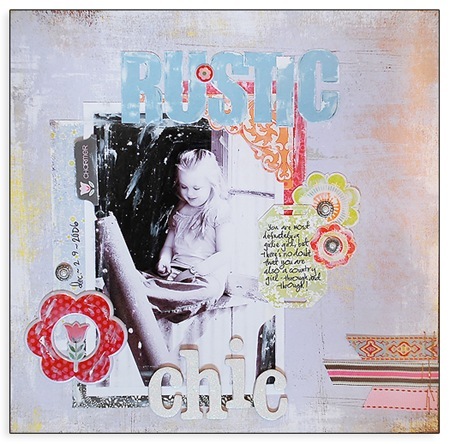 A big thank you to Ann Lederhose for sharing her scrumptious layout using the Twirl collection of patterned papers. 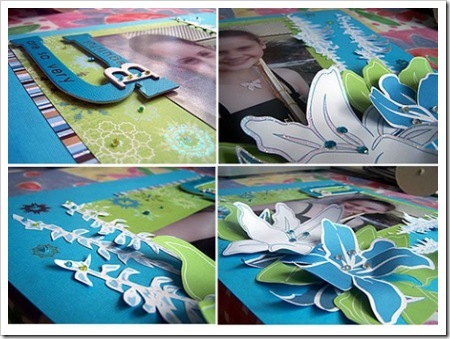 We loved her beautiful use of hand cut and punched flowers and the little added bit of bling scattered throughout the page. 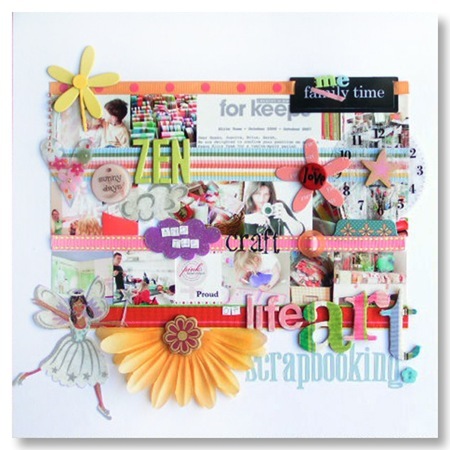 Such a pretty and well balanced layout! 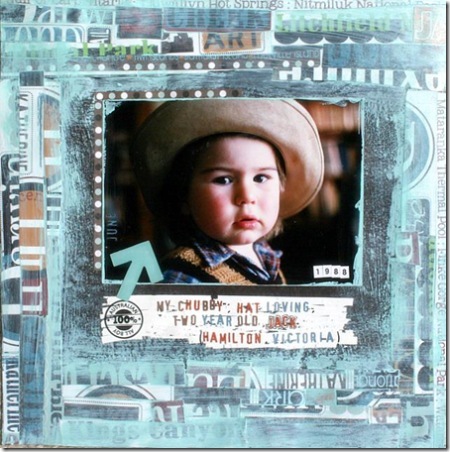 We love this little beauty created by Jamie Gavin using both the Birdie and Cowgirl collection. 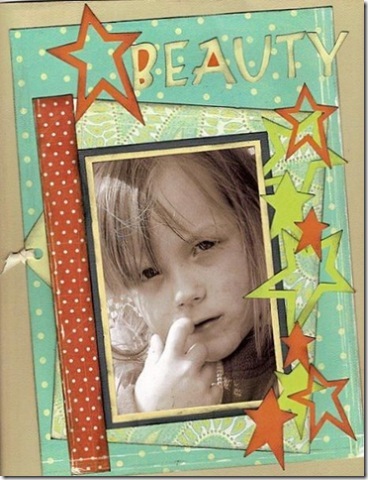 Jamie created the stars by using the reverse sides of the papers. Thanks for sharing Jamie! 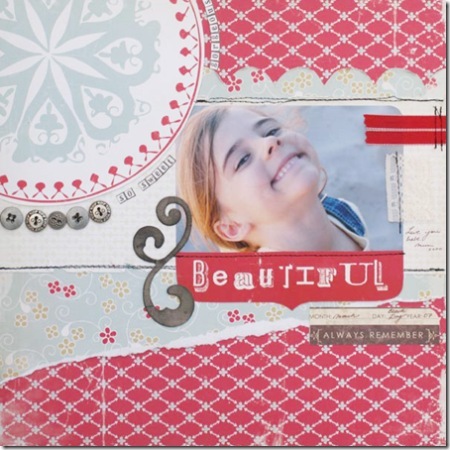 Last but not least this week, the Crush collection of papers are certainly perfect for those upcoming Christmas layouts as Cathy Bodini has demonstrated on this elegant page of her daughter. 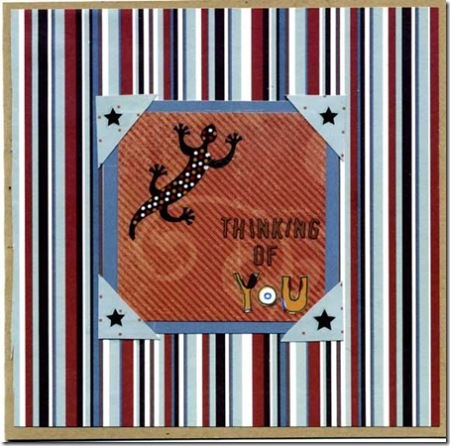 Cathy has also used the patterned papers to cover the brackets from one of the Crateboard chipboard packs (alphabets, numbers & punctuation) and we also adored the cool page title! 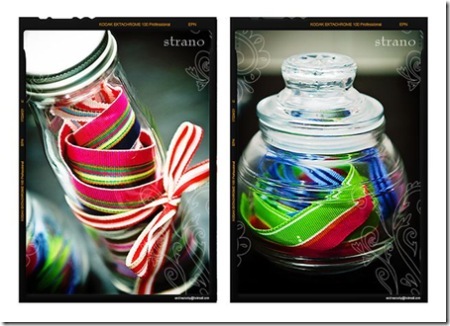 strano designs: we have a winner! 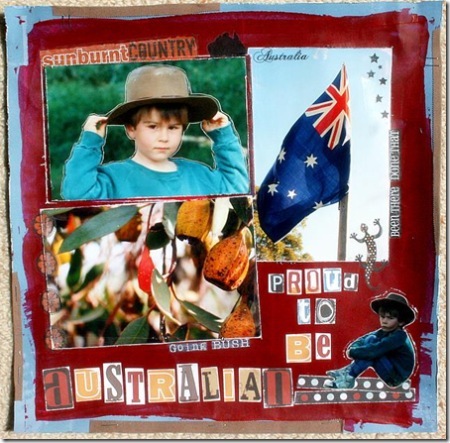 A new comment from “Kelly” was received on the post “weekend inspiration: strano designs” of the weblog “Aussie Scrap Source”. Love it all. 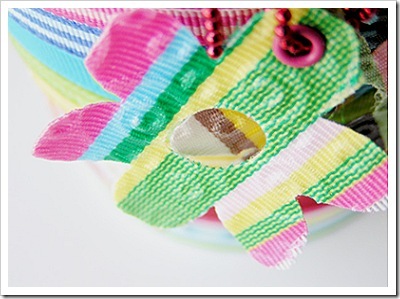 And I love all the colours of the ribbons!! So yummy! 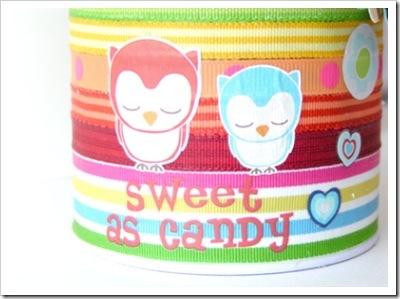 The tin is sooooo cute. I love it!! 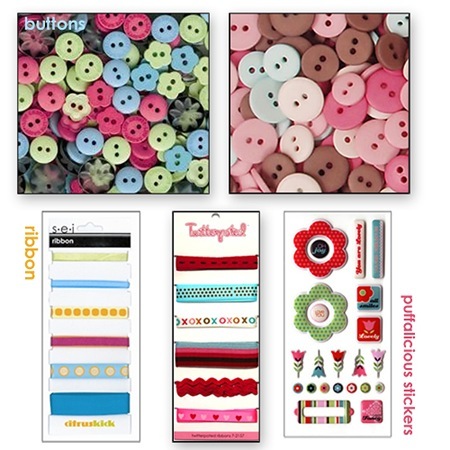 here are the offerings from our design team in the form of class kits for november. 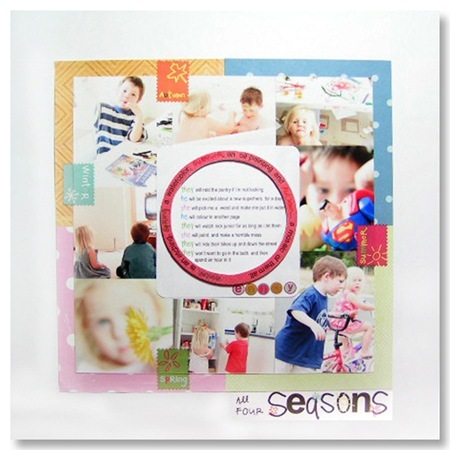 a smattering of early christmas and a host of other great ideas and layouts. all of our kits come in a complete self-contained pack, with everything you need to do on your own at home, or in a class environment. 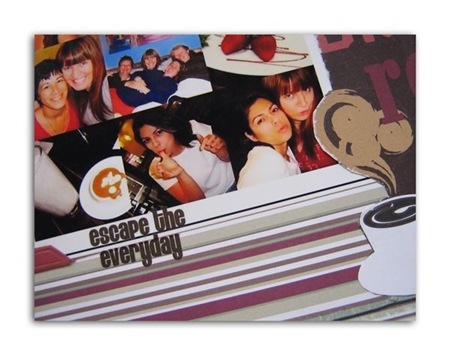 if you like the look of any of these, or earlier ones, just ask your local scrapbooking store to order it in for you. 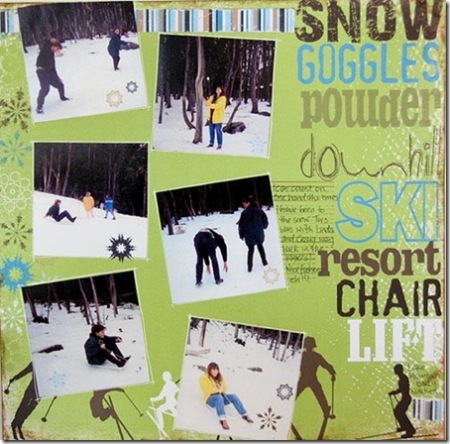 the kits themselves can even make great christmas gifts for your scrappy friends. 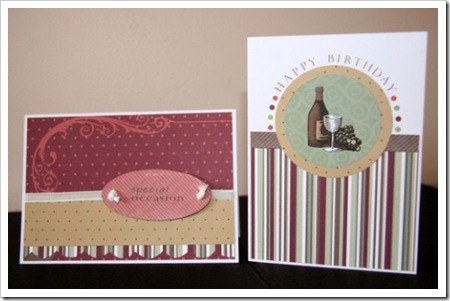 This elegant layout and card incorporates beautiful Christmas colours without being overly 'Christmassy'. 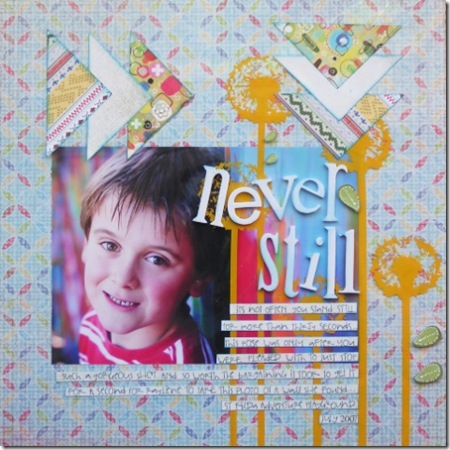 This is definitely a class kit suitable for all levels of ability and will add to your stash with the more than ample full sheets of new Basic Grey 'Mellow' alphabet stickers and Crate Paper bands, tags and frames. 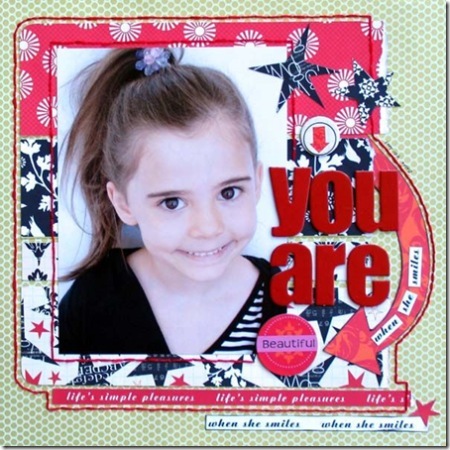 Remember, this class kit will suit any range of themes and does not need to be limited simply to Christmas photos. If you're looking for a class kit that is both versatile, yet beautifully elegant...this is IT! 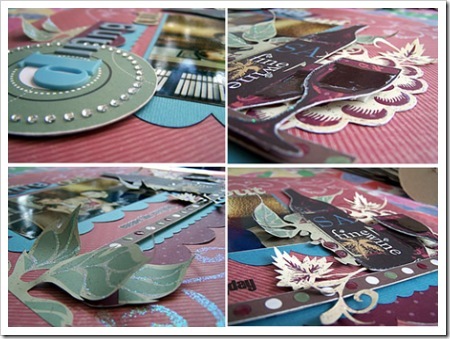 Gorgeous colours, paper curling and handmade embellishments we touch on all of these things in this stunning layout and card set. WeRMemory Keepers products are the focus of this class, with a little BasicGrey thrown in for good measure. 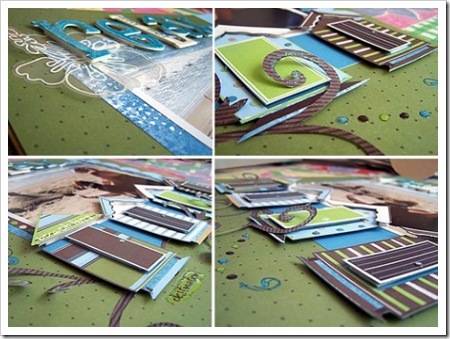 This class will be perfect for beginner-intermediate but creates a layout and card that any scrapper would be proud of. 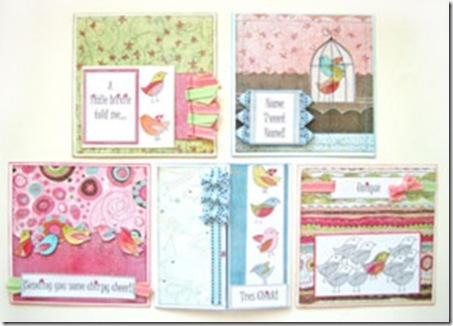 The gorgeous soft Spring Picnic Collection from Jenni Bowlin sets the tone for this very girly double page Layout. 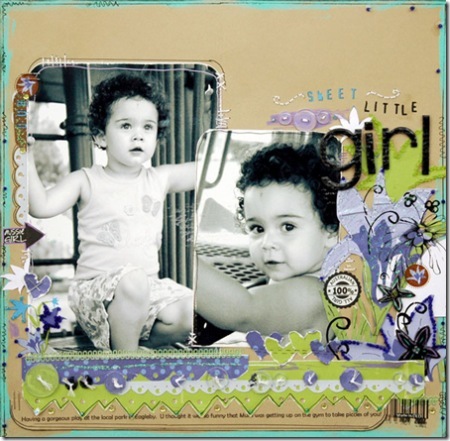 Using freestyle cutting techniques and pen work—this kit can be a double page spread or separated to create two equally stunning layouts of that sassy little girl or girls in your life. 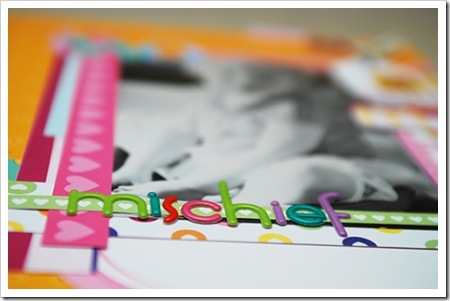 The large sheet of Paperloft monograms will accommodate any title of your choice. 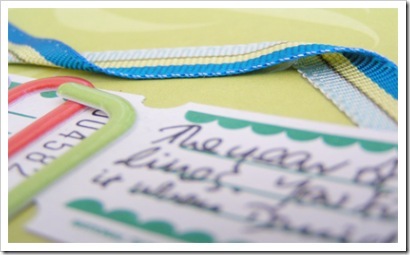 Make this cute little ribbon tag book in no time at all. 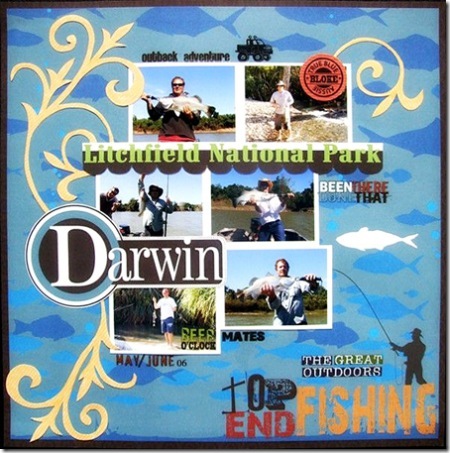 As a brag book it can be a great quick Christmas present for a loved one or perfect to hang off your own bag or key ring. 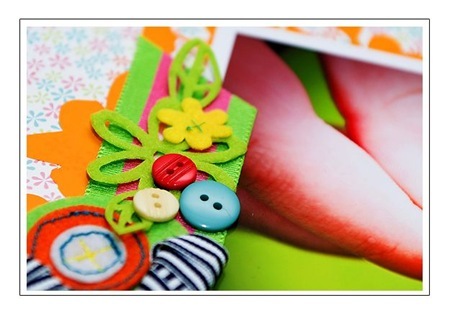 Learn of the wonders of Strano RibbonStiff, fuzzy rub-ons and beading techniques in this fresh and fun class. 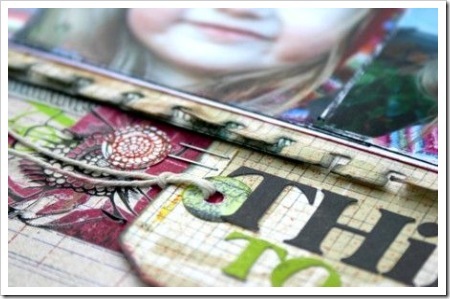 It's time to get started on making some home made gifts to give away this Christmas. 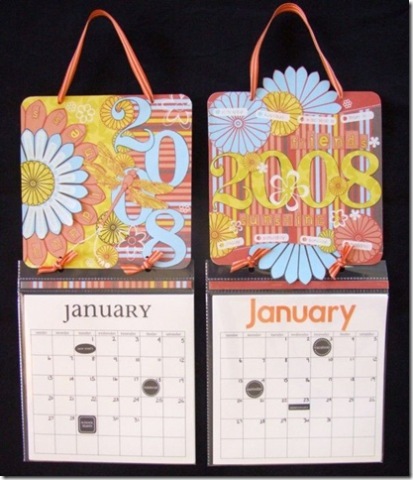 Learn an easy way to create your own calendars using these fun CherryArte papers and Junkitz Calendar kit. 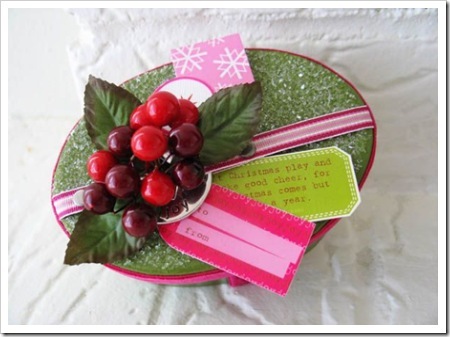 Once you learn how you'll want to make them for all your family and friends this Christmas. 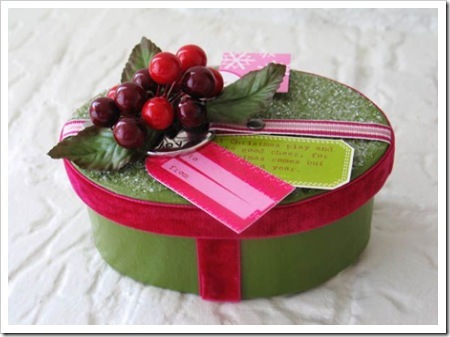 Want to send something special to your friend, sister, Mother or daughter this Christmas? 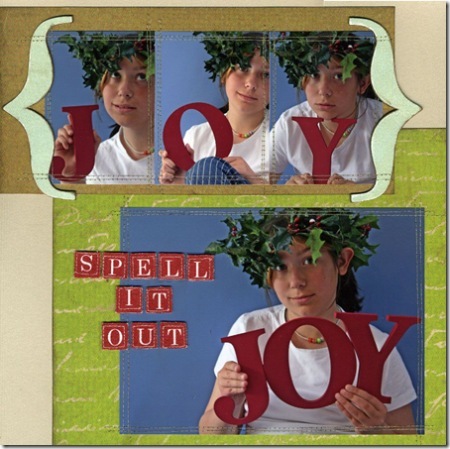 Create these delicious homemade Christmas cards and you’re sure to bring delight to their mailboxes! 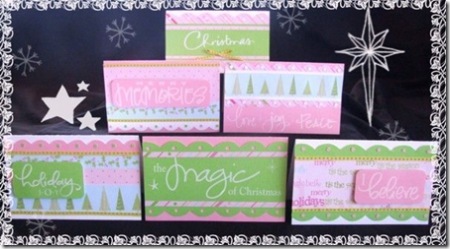 Once you’ve learnt to create these 6 beautiful cards you can use the same designs to create many more in time for Christmas. 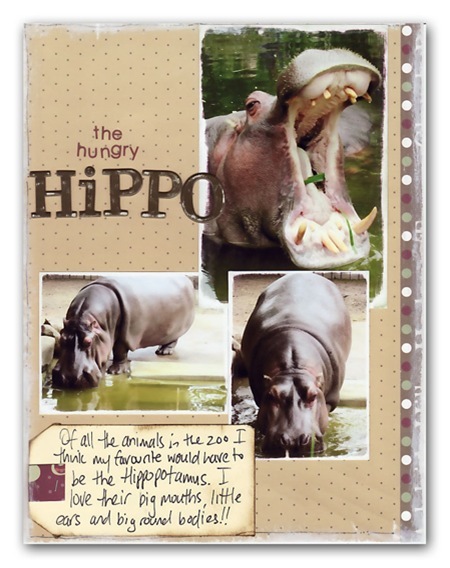 Create these 5 chirpy cards using the lovely BasicGrey Pheobe range of papers, new Hero Arts stamps, water colour pencils which all come together with Strano ribbons and bling! Guaranteed to brighten anyones day! 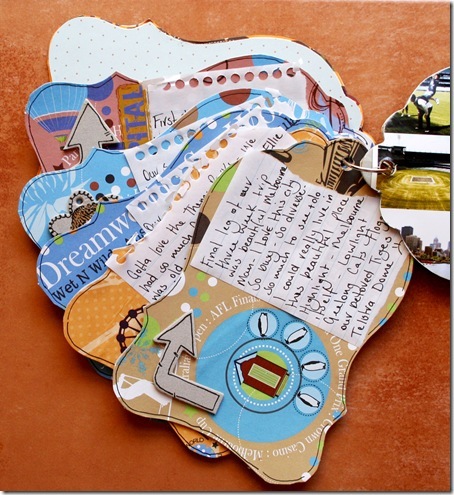 I've always been a big fan of Scenic Route products. In the early days it was mainly a fascination with their double sided patterned papers - so thick, luscious, bold and rich in colour. 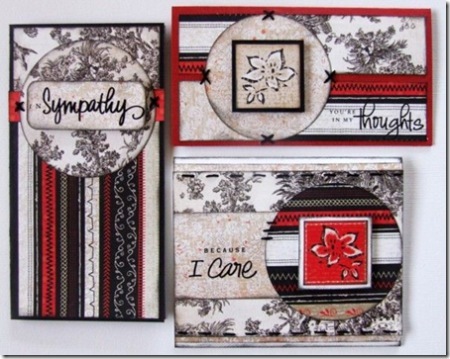 Now I seem to have an addiction for the black and red Berkeley chipboard alphas and all of the seriously delicious chipboard that is available to match each range of papers. 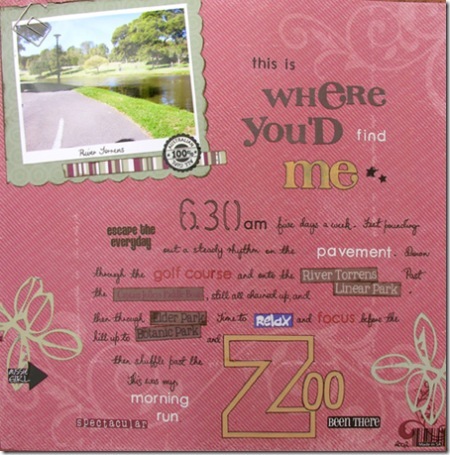 The new Scenic Route Kraft (double sided cardstock) is something that I usually reach for when scrapbooking. 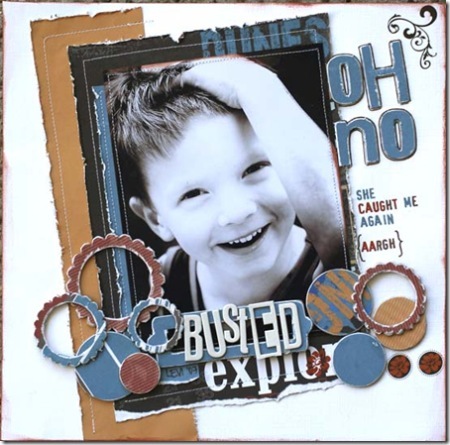 It's great for a layout background or as shown here in my 'come out and play' page, I've hand cut out the circles from a sheet (Ashville Kraft Rings) and used them as an accent to tie in with the photo. 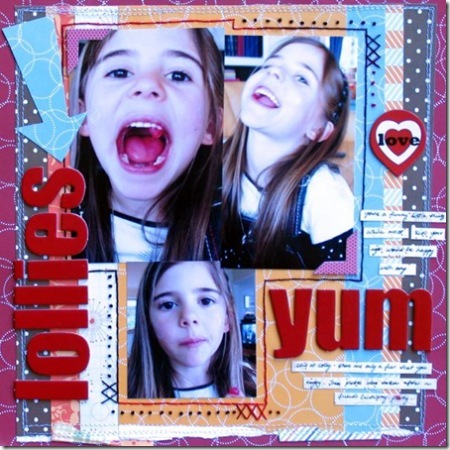 For this layout (lollies yum) I've mixed up old and new Scenic Route papers for the background, layering them in vertical strips before adding photos and hand stitching. I'm also sharing a few of my older favourite Scenic Route projects. 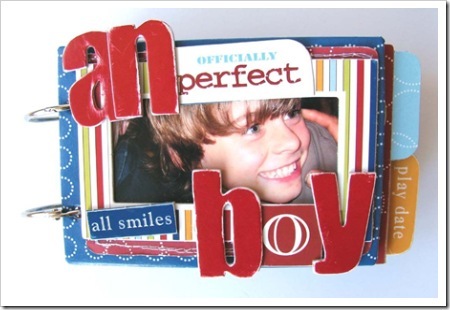 The 'All Boy' mini album is a mix of chipboard, patterned papers, alphas and stickers, mainly from the North Shore range. 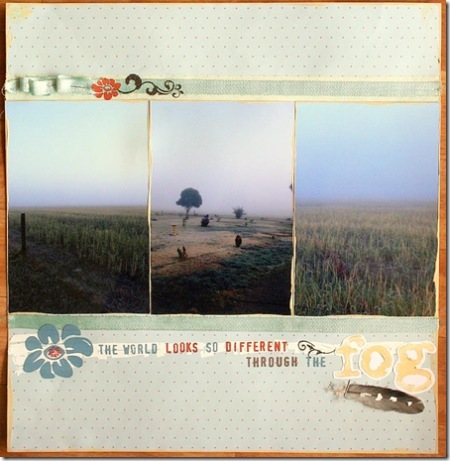 a challenge to our readers: WOW! We've been bowled over by the response to our challenge - thank you!! We need to close off comments now, but we're thrilled that so many of you are willing to share and contribute to this launch with us. Over the weekend we will be contacting the lucky winners - although the selection process will be partially random we also need to match your colour choices with the different lines in the range and end up with a roughly equal number of contributor to each line... with 155 responses it's an unenviable task!! The fun bit though, will be letting you know you've won. we love that we have so many comments and visitors to our blog, and along with our little weekly giveaways, we thought we'd issue a challenge and have a massive giveaway as our way of thanking you for stopping by, and discovering a whole new bundle of talent at the same time. 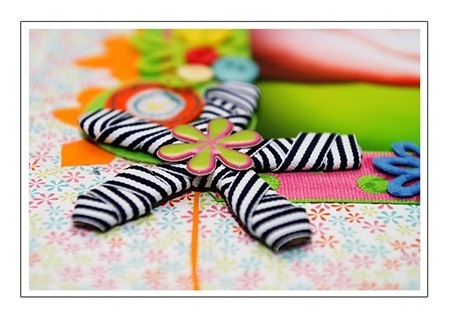 we'd like YOU to contribute to our blog and have some fun with a fabulous new product range we're showcasing soon. 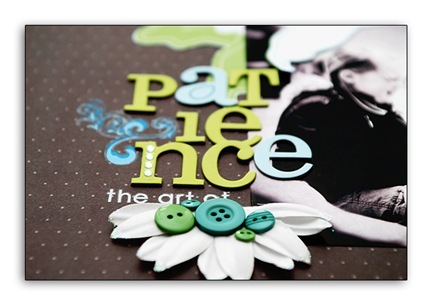 leave a comment on this post and we could be sending you out some free product to play with. in your comment tell us your favourite colours and we'll try and match you up with the right range. 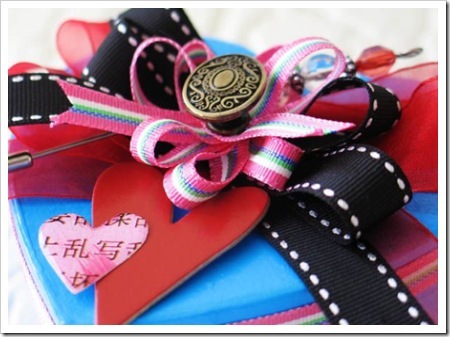 check back on friday when we will randomly draw about 20 names and send out your parcel. please note the only catch is that we want to post your work on our blog in the week commencing 26 November, so by leaving a comment you need to be able to commit to being able to send us images of your finished projects by Saturday 24 November. 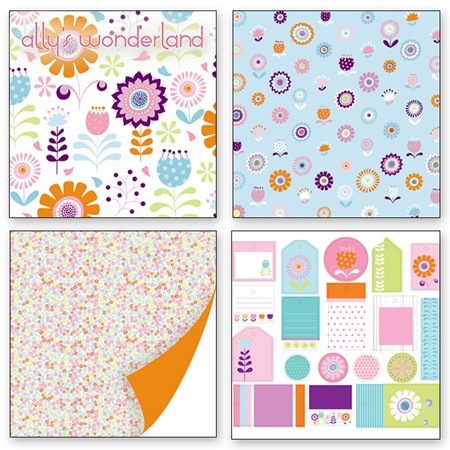 we're talking about an exciting new patterned paper and product range here, and you could be part of its launch! would you like to?! 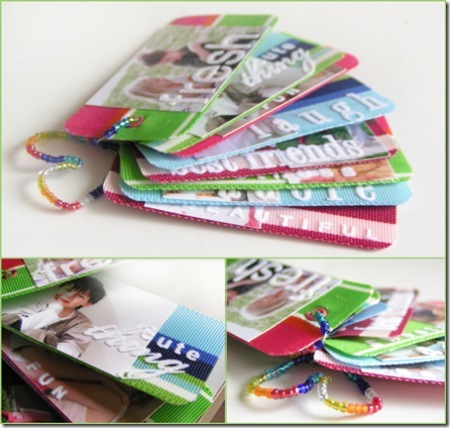 tell us what colours you like best to scrap with. Take a look through any of my albums in the last 3 years and it’ll be easy to spot one of my favourite manufacturers, BasicGrey. 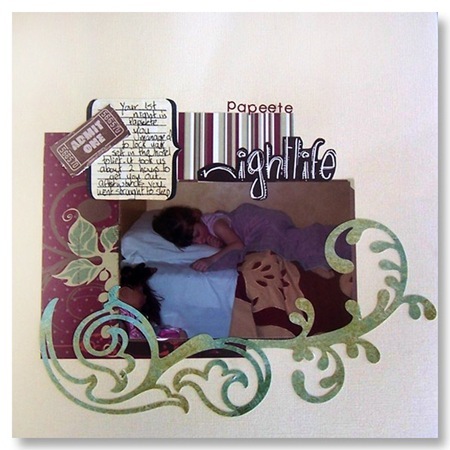 I have pages created with products dating back to the very first ranges they released. I remember the first range I fell in love with – Sweetpea Alyssa – from there I really didn’t look back. BasicGrey is a Utah based company. Much curiosity has surrounded the name and its origins. 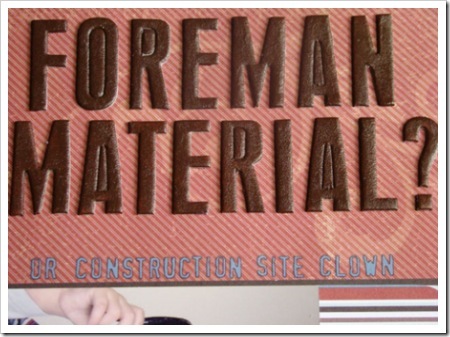 I remember reading how the name was created in one of their very first online newsletters. The shortened version is that originally the owners were going to sell the designs – at the last minute they decided to set up their own company. During the registration process they were asked for a name – which they had not thought of. Looking at her freshly painted grey walls, Rachel quickly decided on the name ‘BasicGrey’, put that down thinking she could always change it later. 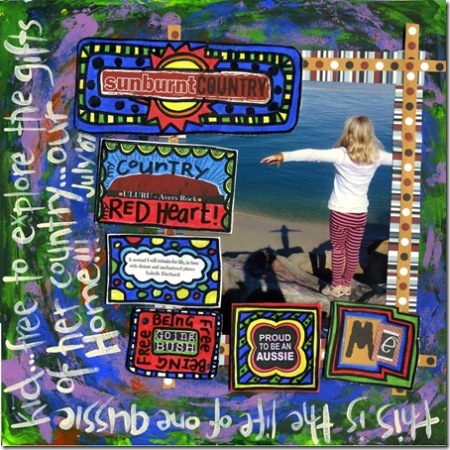 The link to the newsletter has all the info on why she decided the name was actually perfect for the range. 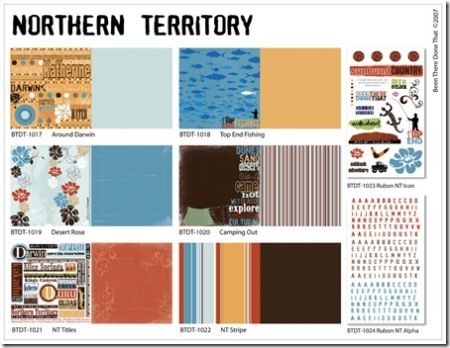 The 4 ranges of paper released at CHA in July are among my current favourites. 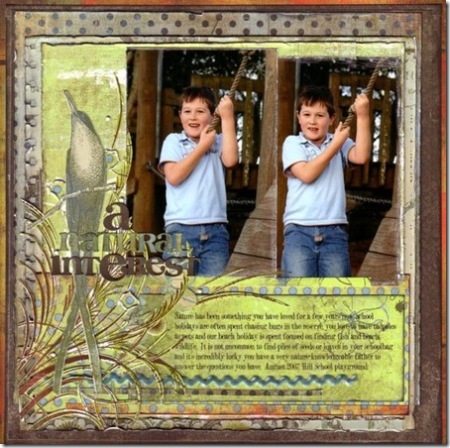 I created the layout “A Natural Interest” primarily with the Periphery papers, but if you look closely, I have included papers from some of the older lines too, such as Lollipop Shoppe and Sublime. 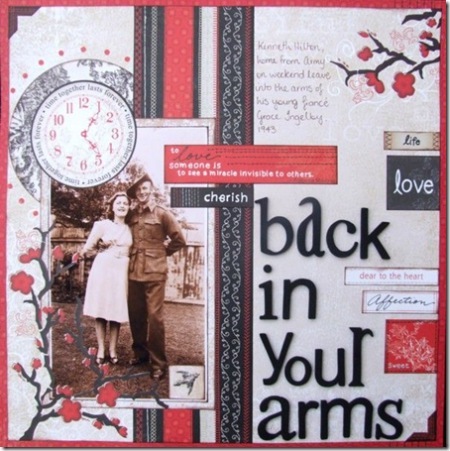 Everything on the layout, from the layers of papers, to ric rac, lettering and this gorgeous hand cut bird are all BasicGrey products. 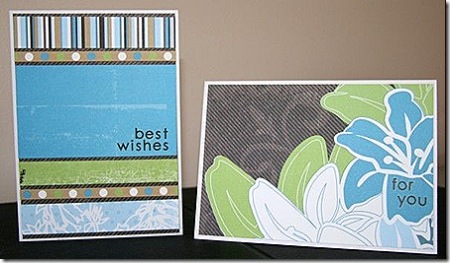 With the 4 new ranges released in July came new products for BasicGrey as well. 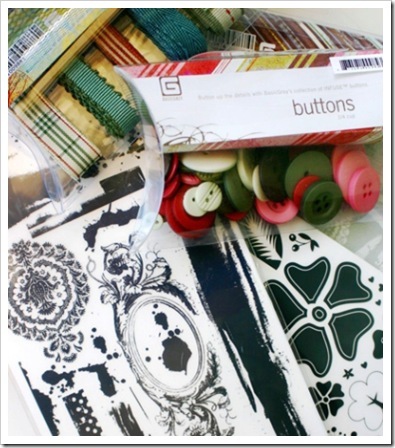 I was one of the scrappers jumping up and down in excitement as I saw the images of packets of buttons starting to appear on the internet. 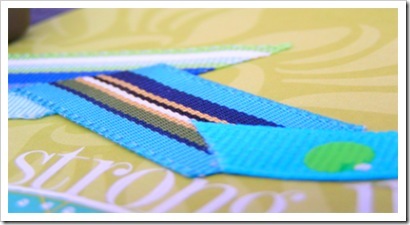 Along with the addition of buttons, they changed the packaging of their ribbon. 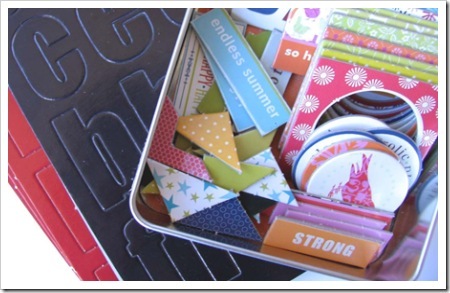 BasicGrey ribbon has been a staple of mine for a while now; it was exciting to see easier-to-store packaging. One of my favourite things about BasicGrey is the way it coordinates with itself. 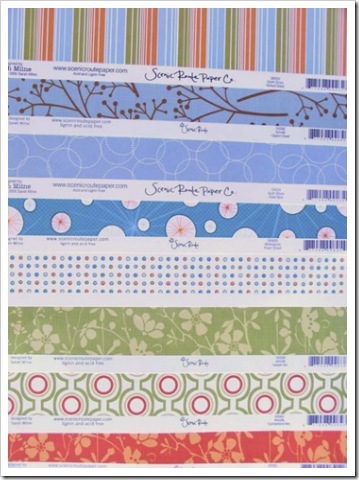 Obviously each range has patterned papers, solids, die cuts, chipboard, rub-ons etc that coordinate, but I love the way I can pick and choose papers from various ranges and they still seem to go together wonderfully. 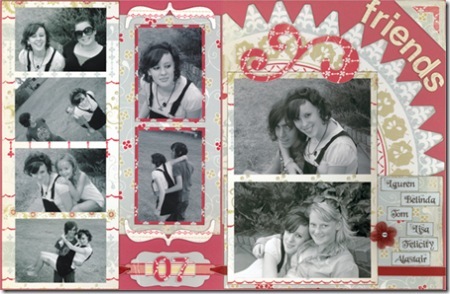 Take this page for example. The main papers you can see here are from the Recess range – but along with it are elements from Mellow, Periphery, LilyKate and Perhaps. Add various rub-ons and the page is complete. While I love creating with BasicGrey myself, I am also constantly finding myself drawn to layouts created with their products as well. 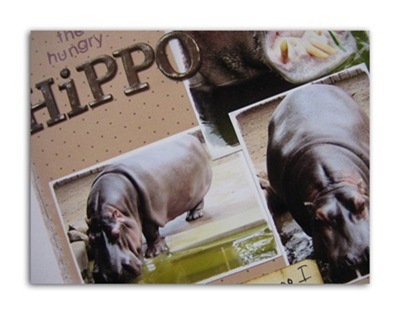 Odds are if I love a layout in a gallery or magazine, it will have ‘BasicGrey’ in the supplies list. 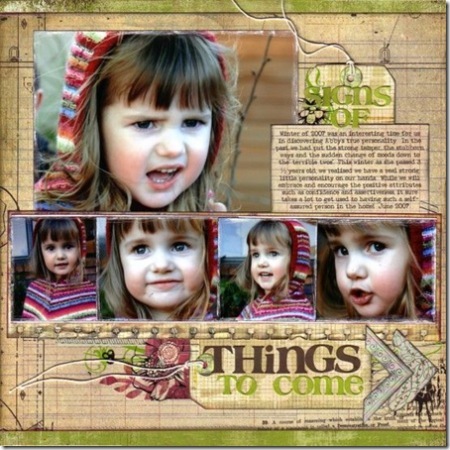 Great examples of this are these layouts below, all by Kelly Goree. Alexis, created with the Recess range. 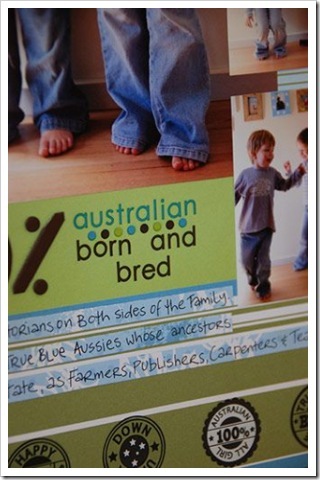 The gorgeous little people in this layout are rub-ons. 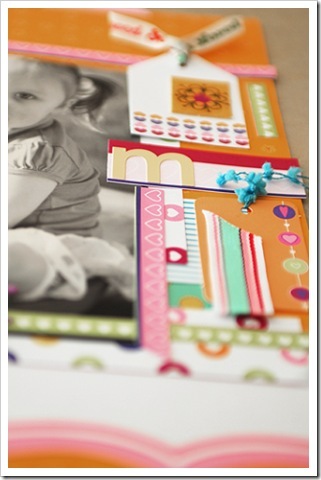 I love the new chipboard lettering shown in this layout too. (I’m a sucker for chipboard alphas!). 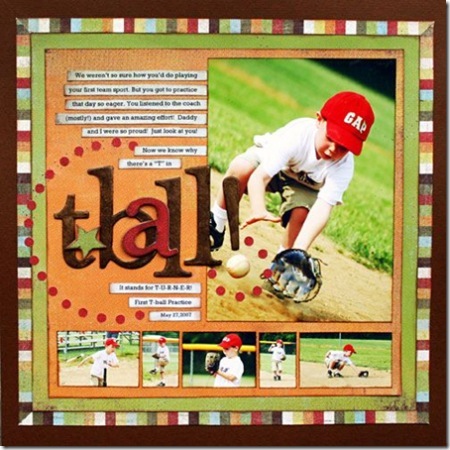 T-Ball was created with the Mellow range. 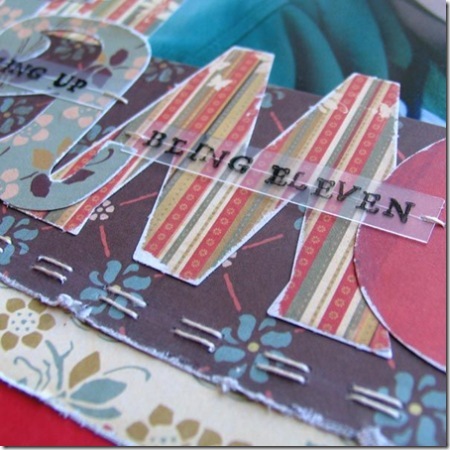 Brown is one of my favourite colours to scrap with at the moment, pair that with orange and red and I’m a happy girl. This layout caught my eye as soon as I saw it. 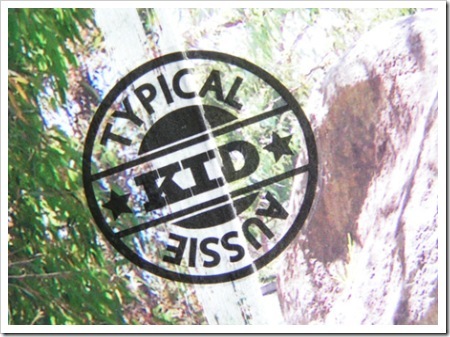 Stitch was created with the ‘Obscure’ range. Occasionally BasicGrey brings out papers that I am not sure on initially, and Obscure was one of those ranges. The tables have turned now though, as I find it one that I turn to regularly. 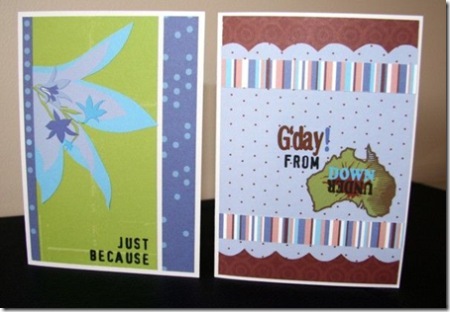 While BasicGrey release new designs and products (can’t wait for the acrylic stamps to hit the shelves!) regularly, I find some remain favourites for a long time. 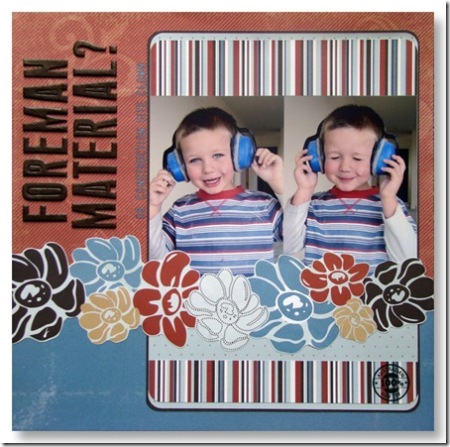 This 2 year old floral project was made with one of my long time favourites, Color Me Silly. The arrangement sits in the doorway of my scrap room. I suspect I won’t be moving it anytime soon!